Monolithic Material and Lining Solutions for cement plants with a high mechanical and chemical stress caused by increasing amount of secondary and/or alternative fuels. The widespread use of alternative fuels in cement production has forced many plants to reconsider their refractory lining concepts. The increasing amount of these secondary/alternative fuels leads to significant chemical and mechanical problems within the traditional refractory linings. Forced by this demand from our clients Refko and Reyma have developed a new range of products and lining concepts. These have been designed to withstand the severe conditions taking place in the refractory lining, specifically in terms of chemical attack, thermal shock and mechanical stress. Firstly we developed a monolithic refractory material that can withstand the problems outlined above. This led to our ZSI product series which was successfully placed on the market in 2003. During burning of the secondary fuels we find a high amount of aggressive gases are produced ( e.g alkaline, chloride, sulphates etc. ). These gases have a negative influence on the performance of refractory materials. These aggressive gases penetrate into the refractory and create an area of attack, specifically the alkali reacts with the aluminium-silicates, to form an alkali-aluminium-silicate of low density and higher volume than the original minerals. This leads to the so-called “ alkali-bursting” an extreme expansion phase causing the destruction of the monolithic lining. Normally, these chemical problems could be overcome by the use of high amounts of SiC in the refractory lining. In the past this technique has worked very well and there were many products available on the market with a SiC content > 40 %. The alkali bursting of an “unprotected” standard product is clearly visible. The “classic” materials with 60% SiC ( 660 SIC ) show an infiltration, but no alkali bursting. Only the ZSI products show no infiltration. Although the laboratory crucible tests are not entitely representative of what happens on an industrial scale, we can be sure of our development by the outstanding performance and references of our ZSI product series in many varied practical experiences. Beside the direct chemical influence of the secondary and/or alternative fuels to the refractory material we have to face some other problems. The use of these fuels also has an effect on the whole kiln burning system and often leads to unwanted deposits and build-ups. These deposits and build-ups have to be crushed down with different cleaning methods ( e.g. air cannons, water cannons, Cardox, etc.) 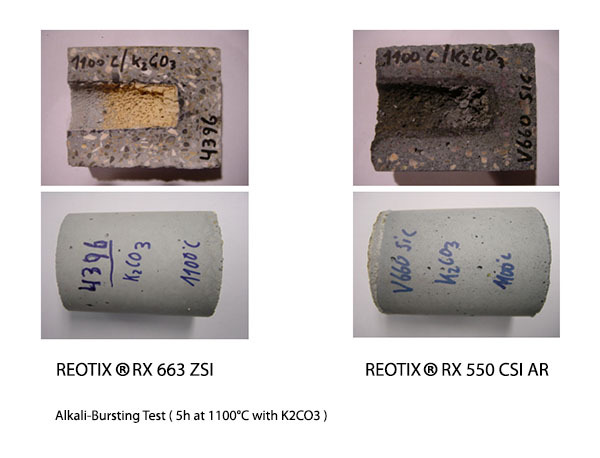 These cleaning methods result in a high mechanical stress on the refractory lining. The cleaning with water also causes an additional thermo-mechanical stress for the refractory. Therefore the refractory must have an excellent resistance against abrasion, mechanical and thermo-mechanical stress. This is solved in our ZSI product series by the use of Zirconia containing raw materials. At the end we would summarise that our ZSI product series is designed to withstand all wear processes found in todays modern cement plant.. The ZSI product series includes traditional LCC vibration castables, self-flowing castables and Shot-Crete mixes. The ZSI is also available as a LCC dry, dense-gunning material with nearly the same properties as a castable material. This gunning material can also be used for hot repairs. Further more we have developed a ZSI material for fast heating-up conditions with SOL-GEL technology. There are areas in the cement plants where a proper dry-out is nearly impossible ( e.g. hot part of the cooler, kiln hood, burner etc ). For these cases our NCC SOL-GEL products are the perfect solution. After de-moulding you can heat up these systems more or less directly with a rate of max. 100°C/h, without the risk of spalling of the refractory lining. As mentioned at the beginning it would be too easy if all the refractory lining problems caused by the secondary/alternatives fuels could be solved only with a state-of-the-art refractory material. The corrosion of the metallic anchors is one more of the great challenges that had to be solved. Depending on the due points of the corrosive gases the condensation at the metallic anchors leads to massive corrosion. Due to the high density of the ZSI products the amount of gases that reach the anchors can be reduced. For very hard corrosive conditions as an additional solution we developed our REFKO SEAL ANCHOR System: The metallic anchor is protected in an inner ceramic ZSI core with special coating and heat treatment. We then obtain an almost gas tight ceramic ZSI body allowing no corrosive gases to reach the metallic anchor. There is no condensation and corrosion to the metallic anchor with the inner core protected by an additional layer of ZSI castable. With our ZSI products series used in combination with the SEAL Anchor system we offer a state-of-the-art refractory lining to solve all the problems caused by the use of secondary and alternative fuels. At the moment there are very positive field tests with an advanced grating system to further minimise problems caused by abrasion. Pre-Shaped block solutions will also find more and more wider use. Together with partners like Jünger+Gräter GmbH we are working on a monolithic rear ventilated lining system, to inhibit anchor corrosion combined with better thermal insulation of the casing. The system with the branding JuSyS®ACL is a technology transfer of the well known and very successful used lining concept in waste incineration industry. We See Reyma Reotix Company as leading examples of this modern kind of solution based refractory suppliers.